Did you hear about the restaurant on the moon ? After a couple of months, decided to plan for a full moon shoot for this year ! 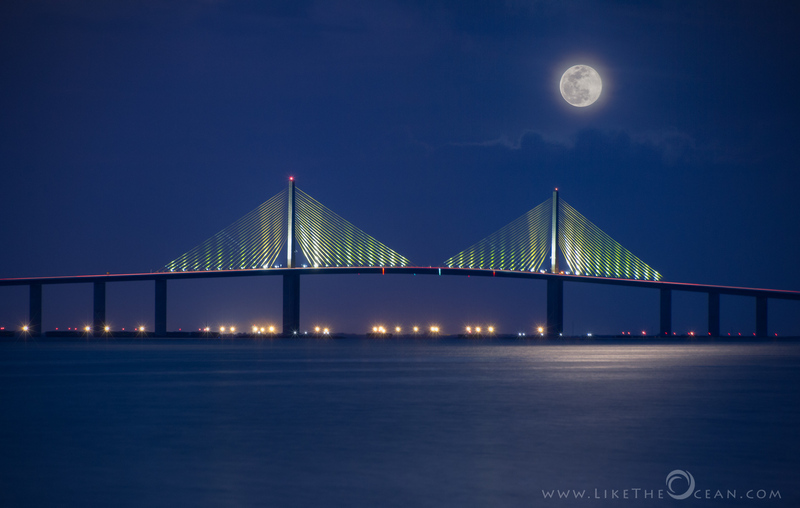 After scouting couple of locations, decided the Sunshine Skyway bridge would provide a nice backdrop. May be, without realizing, I was trying to mimic the mountains with this urban set up :). Anyway, weather had different things in store for the evening. It was so cloudy by the horizon, that the supposedly big moon, was not even visible during the rise. Then began a game of hide and seek. Eventually, she peaked out for a while, giving just enough time to capture this scene ! Amazingly Beautiful . Could you please tell me from which location you shot this? I came to know that the view from Fort De Soto requires a long lens, is it too far? 200 or 300 mm would be enough? Thank you. Beautiful photographs, enjoyed reading the blog.